Good morning folks it's that time again for another Gooseberry Patch Early Bird Review. Do you cook solely from scratch or to do you take a few shortcuts in your cooking? Most people frown upon cooks that use time - saver ingredients, but personally I don't think there is anything wrong with taking shortcuts. 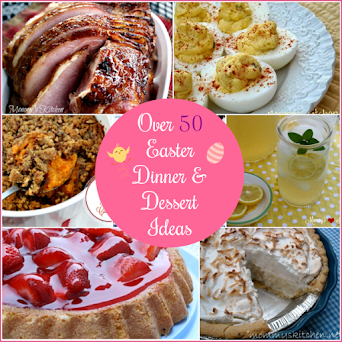 I for one rely on time saver ingredients in quite a few of the recipes that I have on my blog. If you're like me than Gooseberry Patches Simple Shortcut Recipes is the cookbook for you. Simple Shortcut's has 225 simplified recipes and time saver tips for today's busy cook. The best part is all of the recipes speed up your favorite dishes by using grocery-store convenience products. Now you can have dinner and dessert on the table in no time. As usual the hardest part is thumbing through the cookbook and trying to decide on what to cook. I don't know why but I'm always drawn to the dessert section of any cookbook. Well this time was no different. I needed cookies for a get together so all of the recipes of choice are cookie recipes!!! The first one is for Easy - Peasy Monster Cookies from Nicole Culver in Lafontaine, IN. 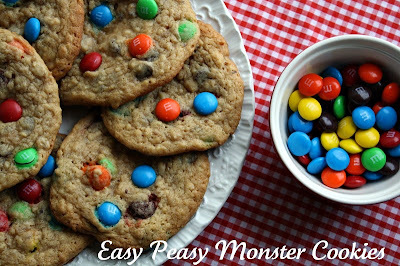 This recipe uses packaged cookie mixes (chocolate chip and peanut butter) to make these monster cookies a breeze to throw together. Just add oatmeal, eggs, butter and m&m' s for a simplified version of an old classic recipe. These Lemon Iced Cookies pictured above come from Paula Eggleston of Knoxville, TN. This recipe utilizes a cake mix which I love. I'm a big believer in using a cake mix to simplify any recipe. Well, these lemon cookies do not disappoint. This cookie recipe only requires 4 ingredients, a lemon cake mix, oil, eggs and a bit of sugar. Then finish them off with a simple powdered sugar glaze. If you're a lemon lover you have to make these cookies. We polished off the first batch so I had to make a second one to take. If you don't have a big sweet tooth like me don't worry because Simple Shortcut's has plenty more to choose from. This cookbook is broken down into 6 tasty chapters. Not only are there recipes, but in usual fashion they have Tips and Tricks scattered throughout the cookbook. One of my favorite tips in this cookbook is one that I actually practice. "Save the wrappers from sticks of butter and store them in your freezer (plastic bag). This way you have them on hand to grease a baking pan. " Another great addition that Simple Shortcuts has is a "Common Ingredient Substitution Listing" found in the back of the cookbook. There's also an additional listing on Herb and Spice Substitution. This will come in very handy for me. And the last cookie of choice is from yours truly. I was so excited to see that Gooseberry Patch included my simplified version for Fudge Puddle Cookies! 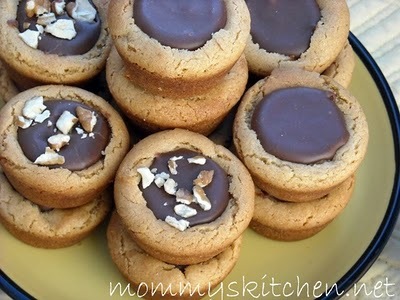 If you love chocolate and peanut than you can have the best of both worlds with this cookie. I have found that the shortcut recipe is just as good as the full homemade version. These cookies are great when you want to impress your guests, but you don't have a whole lot of time on your hands. Click here to get the recipe. 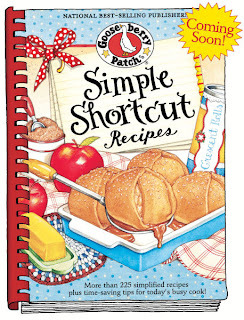 Simple Shortcut Recipes was just released on March 16Th and Amazon has plenty of copies in stock. Right now you can snag this cookbook for just $11.52 that's a $5.43 savings. I promise you won't be sorry. I would like to thank Gooseberry Patch for sending me a review copy of this wonderful cookbook. And a double thank you for sending me a second copy. That's right folks Gooseberry Patch sent me an additional copy of Simple Shortcuts to giveaway to one of my readers. 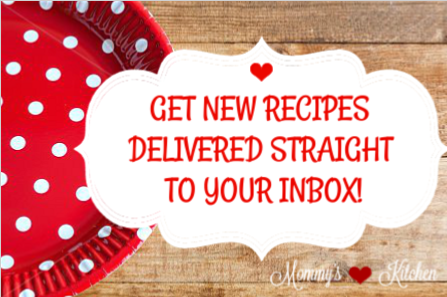 Just leave a comment on this post telling me what simple shortcut you use in a recipe? (mandatory entry) For me it's definitely using a cake mix to simplify a cookie or cake recipe. Last day to enter this giveaway will be at Midnight on March 28th, 2012 (CST). I will pick a random winner using random.org and announce the winner on this blog, face book and twitter. Good Luck everyone. Contest open to U.S & Canadian Residents only due to shipping charges. Winner has 48 hours to reply to winning email or a new winner will be chosen. Please leave a email address with your comment in the event that you are the winner. Disclosure: Gooseberry Patch provided me with a copy of " Simple Shortcut Recipes" for the purpose of this review. They also provided an additional copy to use in a reader giveaway. With that being said the opinions & comments stated above are entirely my own. I would like to thank Gooseberry Patch for choosing Mommy's Kitchen as a "Early Bird Reviewer" . In a large bowl, combine all ingredients; mix well. Drop by rounded tablespoons on un greased baking sheet. Bake at 375 degrees for 12-13 minutes or until lightly golden. Cool for 2 minutes and then transfer to a wire rack to cool completely. Makes 1 1/2 dozen cookies. In a bowl blend dry cake mix, oil and eggs. I used my kitchen aid mixer for this. Mix until the dough comes away from the sides of the mixing bowl and the mixture is combined. Roll into one inch balls; place 2 inches apart on a lightly greased baking sheet. Place sugar in a shallow bowl. Press each ball with the bottom of a small glass that has bee dipped in sugar. Bake at 350 degrees for 8 minutes. Do not allow the cookies to brown around the edges. Remove cookies from baking sheet immediately. Place on wax paper; drizzle with vanilla frosting while warm. Makes 2-3 dozen cookies. In a bowl, whisk all ingredients together and drizzle over cookies. Pillsbury Pie Crusts. I don't really like pie crust, so I'm not good at making them. So I cheat and buy them. Also layering graham crackers, vanilla pudding and topping it off with whipped cream is so yummy! I am already a fan of Mommys Kitchen on facebook. I can't wait to get this cookbook (either winning it, ha ha or buying it). I love to use the cookie mixes. I'm a fan of GBP on FB. I'm a member of the GBP circle of friends. I am a fan of gooseberry, a fan of yours and joined there site. I just posted about this giveaway. I so hope I win. I love your site and im not just saying that. I mean it. You save me a lot of heart ache. I add lemon juice to regular milk for quick buttermilk! I cheat and use pre-made pie crusts and cake mixes whenever I can. I'm a fan of Mommy 's Kitchen on FB. Easy French Toast - Mix eggs and french vanilla flavored coffee creamer together - that's it - no other ingredients needed - easy & yummy!! I like Mommy's Kitchen on FB. I love using cake mix for cookies, and special cakes by adding my own touch. 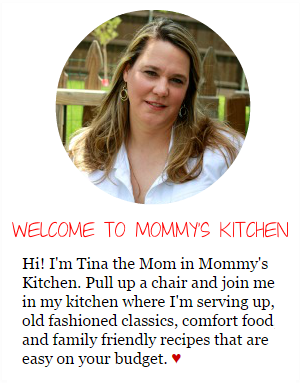 I am also a FB friend of Mommy's Kitchen. Love it! I use Bisquick mix to make drop cheddar biscuits. I love to use cake mixes to add to desserts. i would LOOOVE to win! i am facebook fans of both and i get the newsletter! First time to do this..here goes. I use cooked brown rice in meat loaf to extend the amount when needed or make porcupine balls or a little extra chili. Also healthy and adds fiber to the diet. Your books rock and I just bought my first..farmers market cooking. I love short cuts! 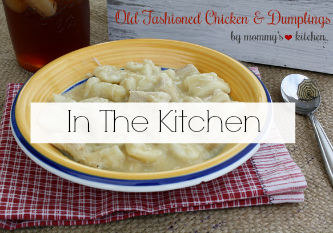 I use cake mixes a lot, but also use refrigerated biscuits in my crockpot chicken and dumplings! Just as good to me! 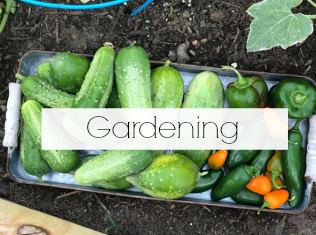 I'm a new fan of Gooseberry Patch on FB! I'm already in the "Circle of Friends"! I like to buy pre-diced vegetables from the grocery store when I make shredded chicken tacos in the CrockPot. All it takes is chicken breasts, jarred salsa, taco seasoning, and peppers/onions. It's really quick and easy to throw together if the dicing is already done! I never make my own crust! i buy stock in a box. i never bake my own sandwich bread. i don't even know how to go about drying fruit. I like to use the pre-made pie crusts, especially the graham cracker crumb ones. I joined their circle of friends. I don't cook lasagna noodles when I make lasagna--I just add extra water to the sauce and the pasta absorbs it while it's baking. I know you can buy the "no bake" noodles, but regular old lasagna is much cheaper! I like to use the ready made pie crusts for pot pies as well as dessert pies. All these recipes look great! I see nothing wrong with taking shortcuts; the products are so much better than they were back then! I use ready made pie crust, different gravy mixes, cookie mix and cake mix to cut corners when I need to! I use lots of short cut products - but my favorite is using the cookie mixes to make wonderful bars! We love homemade pizza at my house and have it usually once a week. I go to my favorite pizza place in town and buy the pizza dough that they have made from scratch! Then we can use whatever toppings we want at home! This shortcut saves me plenty of time and money! I like using boxed baking mixes whether it be brownies, cake mixes, or cookies. I love to buy premade pie crust. They are so good now and also like to buy my nuts already chopped. Oh this is awesome I love Gooseberry stuff! I tend to cook from scratch but with a young family I am definitely VERY interested in some handy shortcuts!! The shortcut that I use often is buying diced canned potatoes to substitute for peeling, cooking and cutting my own... saves me tons of valuable time being a homeschooling family of six! Thanks for this opportunity to win the new GBP cookbook, Simple Shortcut Recipes. It definitely sounds like a must have for me! I am a fan of GBP on facebook! Thank you for this opportunity to win their new cookbook, Simple Shortcut Recipes! I am a member of GBP's Circle of Friends! Thank you for this opportunity to win their new cookbook, Simple Shortcut Recipes! 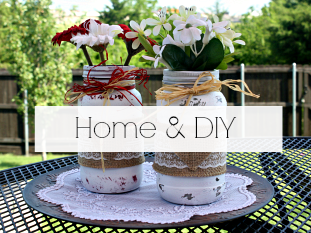 I am a fan of Mommy's Kitchen on facebook! Thank you for this opportunity to win their new cookbook, Simple Shortcut Recipes! I tweeted about your giveaway on Twitter! 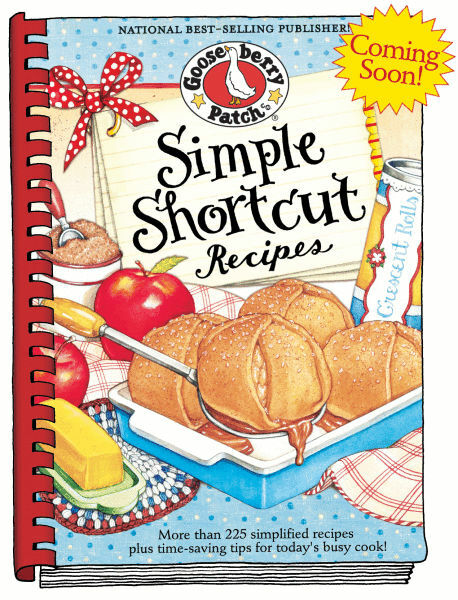 Thank you for this opportunity to win the new GBP cookbook, Simple Shortcut Recipes! My favorite shortcut is frozen bread dough - nothing like the smell of baking bread without the work involved in from scratch bread recipes - also great for pizza crusts. I use a jar of spaghetti sauce for my lasagna. I layer it all in the slow cooker, making sure to cover the uncooked noodles with the sauce and cheese layers. People often ask for my recipe after tasting it. I love short cuts in my cooking and baking. I use cake mix when I make Pistachio Bread or Lemon Poppy Seed Bread. Very good and simple. I just joined Gooseberry Patch "Circle of Friends" ~ looks like a great find. Like you I also use a lot of cake mixes. Already measured, flavored and easy to store on the shelf. I also use ingredients from the salad bar. The bacon is already cooked and chopped. Carrots are already shredded. I can buy just the amount I want for the recipe. And it's actually cheaper than buying a pound of bacon, $4.00 for a package of bacon and about $1.00 for a heaping cup of the salad bar bacon. I belong to the Gooseberry Patch "Circle of Friends"
I use Rotel as a short cut in a lot of recipes for a mexican flavor with out having to cut peppers or chilis myself. Besides using cookie mixes and cakes mixes for a variety of breads and desserts, I use frozen beef and cheese ravoli for a quick weeknight Lasagna. I love Gooseberry Patch cookbooks - real recipes for real people! I don't like to make pie crust so I use the refrigerated ones. I use bagged lettuce as my shortcut when I want to have a quick salad. I just buy one that has everything I like in it, no chopping necessary. I am a fan of gooseberry patch. I cook a whole chicken, breasts or any other type of roast (beef, pork) in rthe slow cooker the shred the meat and freeze for a later use. My simple shortcut is using Stove Top Stuffing mix in meat patties and meatloaf. Just the right amount of breadcrumbs and great flavor! Cheap with coupons around the holidays too! I am a fan of Gooseberry on facebook. I love using canned biscuits for sweet and savory breads. I love to use Cake Mixes for quick desserts. I am a fb fan already!!! Rotisserie chicken makes a great shortcut for casseroles and chicken salad when you don't have time to cook the chicken yourself! I am a follower of your blog on Facebook...love your site and I love Gooseberry!! I use cake mixes in recipes and store bought pie crusts. I love to use already made cookie dough for recipes and I love to use already made pie filling. 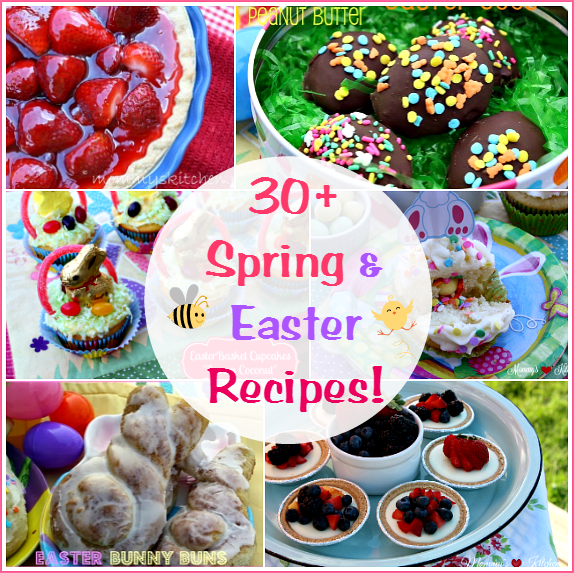 It is easy to throw that with some cool whip and make pink stuff or make an easy cobbler! Sometimes instead of roasting my own peppers (which is a lot of work to me!) I buy the canned ones already roasted! I am now in the circle of friends! I posted a comment on my FB page telling everyone to come enter! I too use cake mixes for short cuts...when the recipe calls for it.I also use shortcuts like using the microwave to melt the butter & chocolate instead of on the stove. I like using dried herbs instead of fresh b/c of always having them on hand. Thanks for the chance to win! Already a fan of Gooseberry on FB. Already a member of Circle Of Friends. My favorite shortcut isn't an addition per se, but I always grate butter when adding it to a recipe that calls for pea sized chunks of butter (like scones) - it makes for far less work and the end product rises more too! I use cream soups to make sauces. My comment is really a helpful hint that I often do. When baking or making any recipe,I have all the ingredients on the conunter and as I use them, I put them aside on another section of counter. That way I can be sure I used it. Too often we rush and overlook the most obvious. I have joined Gooseberry Patch "Circle of Friends"
I am a fan of Gooseberry Patch and Mommy's Kitchen on Facebook. I LOVE to use any shortcuts I can find. I also like using cake mixe recipes. I use instant pudding mix with whipped cream for quick and yummy icing !!! Already a Gooseberry Patch fan and part of Circle of Friends !!! Plus, just became a fan of Mommy's Kitchen !!! Pillsbury Pie Crusts! Best shortcut of all time! I use cake mixes or just put all ingredients in one bowl then blend ...so simple! I use can cresent rolls, they are great for sweet treats such as cheese danish or for a crust for chicken pot pie. They are very verstile. Cake mixes are my shortcut for cookies and bars. Cake mixes... they just make it so much easier to bake in a snap. I just like to make the cookie dough the day before so it's ready to just shape and bake the next day! I don't make cakes from scatch. I use cake mixes for different cakes and sometimes to make cookies. I'm a fan of Gooseberry Patch on Facebook already. I'm a fan of Mommy's Kitchen on Facebook already. VERY cool - my kind of book. I think it belongs in my kitchen. =) I LOVE using cake and cookie mixes also to make things easier and quicker when creating. I am already a fan of MK at FB. HOW COOL YOU HAVE A RECIPE IN THIS BOOK TINA! I am already a fan of Gooseberry Patch at FB. I use lemon juice in milk for butter milk. It's cheaper and I never seem to have buttermilk at the right time! I'm a fan on MK on facebook! For my shortcut I like to use a boxed brownie mix to jazz up brownies or make other desserts with it. I joined Gooseberry Patch "Circle of Friends" more than a year ago. I am a HUGE fan of Mommy's Kitchen on Facebook!! I buy the box banana bread mix and add over ripe bananas and walnuts(even if the mix says it have nuts in it). Neigbors always look forward to the holidays. It really is good---extra moist and loaded with nuts. Would love to win tne cookbook. Read your site all the time. I also doctor up cake mixes for a variety of desserts, including cookies and brownies. Thanks for the opportunity to win a Gooseberry Patch cookbook! :) Btw, love your blog! Just signed up for Gooseberry Patch's Circle of Friends! I use prepackaged cookie mixes to make quick waffle iron cookies for my granbabies. Mentioned this giveaway on my face book page!! I use short cut in all my cooking from deserts to main dishes. My favorite short cut is using pre-cut vegetables and pre-cut salad mix. I'm friends with Mommy's Kitchen on Facebook. I like to chop and freeze pecans in one cup bag portions. I am much more likely to bake treats or make fudge with that step behind me. My shortcut is using Crescent rolls for my crust on pies and anthing else:) Also, I buy my pizza crust instead of making it from scratch. Cake mix shortcut for cookies! I love to have ground beef and chicken already cooked and in the freezer to make casseroles and chili/soups quick and easy. I love to take a cake mix and doctor it up. I agree completely about the cake mix. I have so many recipes not only just for cakes but cookies and bars as well that start with a cake mix. I definitely love shortcuts. It makes this busy mommy's life a little easier! My shortcut is using bottled minced garlic. Fan of Gooseberry Patch on Facebook. Joined Gooseberry Patch Circle of Friends. When I use lean ground beef, instead of draining it and using up another dish, I use paper towels to soak up the fat. Call Mary and A.J. in Rockwall. A.J. needs cakes and pies for customers. I like to make up cookie dough and put in freezer for when family and friends come over I can bake them a fresh batch of cookies. I follow your blog via e-mail subscriber so I don't miss a post. I subscribe to your blog via e-mail subscriber so I don't miss a post. I make cookie dough ahead of time and freeze it for when I have family and friends over I can just bake them cookies from the cookie dough I had prepared ahead of time. It's a time saver for unexpected company also.